BAC Calculator - Fast and Accurate! Thousands of web visitors search the Internet monthly to learn their BAC (blood alcohol content) after they consume a certain number of alcoholic beverages.Some of the Web surfers are looking up information about their likely blood alcohol level after being arrested for DUI. Others are checking BAC levels for types of alcohol like beer, wine, or vodka. By referring to a blood alcohol calculator, an Internet search MAY help an alcohol researcher determine the number of drinks of a certain type and volume (e.g., 12 oz. regular beer) that it would take for him or her to reach the legal alcohol limit. Like with all Web research, not every blood alcohol level chart is accurate or reliable in producing a precise “number” that will reflect your legal blood alcohol level. Doing some basic testing at various Web locations that have an interactive BAC chart program running, the range of answers can vary from 10% to 30%. So, never trust an alcohol content “drunk calculator” for an exact answer. Sophisticated computer software has been created by several experts in alcohol testing. Probably the best of these programs is the BAC Tracker software. This program allows the user to calculate a person’s specific body “factors” for calculating BAC level through “forward” calculation or “back” calculation. Plus, height, weight, and other variables can be plugged in for a more accurate calculation. More importantly, the software verifies the plotted “results” by simultaneously checking the blood alcohol content of your test subject against the top, large scientific studies by Widmark, Jones, Forrest and others, where thousands of male and female human subjects were collected and reported based on gender, body type, and other forensic data. The user can track all researchers, one, two or any number. For most individuals, the chart set forth below can be used to estimate your blood alcohol level with a 0.01 to 0.02 grams percent true value. Be aware that peak alcohol level can be affected by a wide variety of health, mixer, food, and medication variables of the drinker. By knowing how to prepare yourself for imbibing alcohol, you can either help yourself or hurt yourself in keeping your BAC level at a lower peak alcohol level. See this link to learn more about this subject. These rules of thumb need to be followed to assure that you are calculating your approximate BAC correctly. Your objective is to conservatively gauge your lean body mass and to extend the “wait” time before you get behind the wheel. The BAC chart shown below assumes no food, but you need to stay with these numbers and not assume that your food intake will “hedge” your BAC results. Monitor the dose of alcohol that is put in your glass. 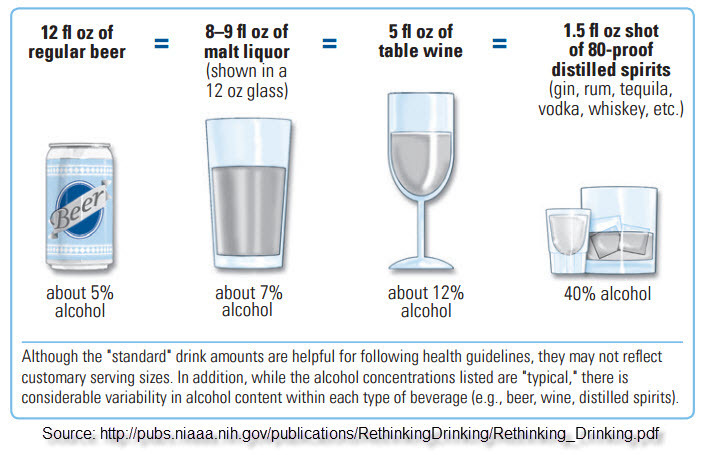 With mixed drinks or wine, the drink can often be a double, and escalate your BAC far over these BAC calculator numbers. Food eaten AFTER you are finished drinking alcohol will not lower your BAC, nor will it diminish your “peak” blood alcohol level. Eat before and during to help lower your peak BAC level. Never assume that doing field sobriety tests for an investigating officer MAY result in being let go. These “exercises” are not scientific, are NOT graded “normally,” and are designed to gather bogus police evidence for your trial. If you have monitored your alcohol and your “wait” time before driving, you should have no fear of taking the official test requested by the police officer. Remember that breathalyzer tests ONLY show ALCOHOL results, but that blood test results or urine test results show ALL impairing substances. So, if asked for a breath test, be ready to submit, but request an independent test AFTER you have complied with the official forensic breath tests. You need to be able to pay for this blood testing, and (in some states) may need to locate a blood draw nurse, EMT, or phlebotomist. More and more states are obtaining forcible blood draws pursuant to the arresting officer seeking involuntary collection of blood under a judicial warrant. If you refuse a breathalyzer test in many states (California, Texas, Arizona, Georgia), your officer has the right under State law to compel blood via a search warrant request to a magistrate judge or other judicial officer. By following all other rules not incriminating yourself when being investigated by a law enforcement officer, you will increase your chances of giving your DUI lawyer the best chance to win your case. Remember, what comes out of your mouth in conversation is what convicts most people. Shut up! Name and address only. No conversation about anything else, especially how much you had to drink. Call and speak to one of our top DUI lawyers in your area to learn how to defend against high BAC test results. Our number is 844-832-6384, and we are here to help day or night.